In this book, the authors provide an overview of the 6LoWPAN family of standards, architecture, and related wireless and Internet technology. Starting with an overview of the IPv6 ‘Internet of Things’, readers are offered an insight into how these technologies fit together into a complete architecture. The 6LoWPAN format and related standards are then covered in detail. In addition, the authors discuss the building and operation of 6LoWPAN networks, including bootstrapping, routing, security, Internet ingration, mobility and application protocols. Furthermore, implementation aspects of 6LoWPAN are covered. 6LoWPAN: The Wireless Embedded Internet is an invaluable reference for professionals working in fields such as telecommunications, control, and embedded systems. Advanced students and teachers in electrical engineering, information technology and computer science will also find this book useful. Zach Shelby has an M.Sc. (Eng.) from the University of Oulu and a B.Sc. (Eng.) from Michigan Technological University. Zach worked for 10 years as a research scientist and research manager first for VTT and later for the Centre for Wireless Communications (CWC) and has been responsible for developing innovative research in the area of wireless embedded networking and short range communications. He regularly teaches tutorials and courses on IP-based wireless embedded networks at high profile events around the world. Zach is one of the founders of Sensinode Ltd. currently in the position of Head of Research. Carsten Bormann received his Diploma in Computer Science in 1985 and his PhD in Engineering (Dr.-Ing.) in 1990 from Technische Universität Berlin. Serving as a Honorar Professor for Internet technology at the Universität Bremen, he is member of the board of its Center for Computing Technology (TZI); he is also a Visiting Professor at the Design department of the Universität der Künste in Berlin. His research interests are in protocol and system architectures for computer-mediated communication between humans. Geoff Mulligan has previously worked in the computer and communications technology department at the Pentagon, developed network support and taught computer science classes at the Air Froce Academy. After leaving the Air Force he joined Digital Equipment Corp (DECLabs) in Palo Alto and worked on tcp/ip, email, security and firewall (DECseal) technologies. Currently, Mulligan providing consulting to a few companies in the areas of RF, Protocol design, system and protocol security, and Linux, Unix. 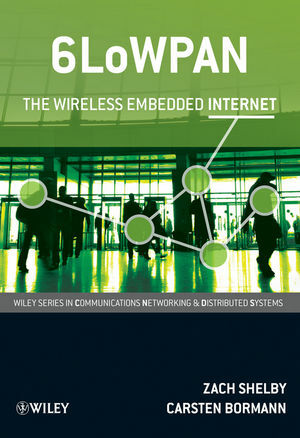 The Wireless Embedded Internet Visit the authors' website to find out more about 6LoWPAN and to access the companion material, including tutorial slides, course material and open-source code examples.